Last week's fan mail was sent by Uncle Death from Let It Die! 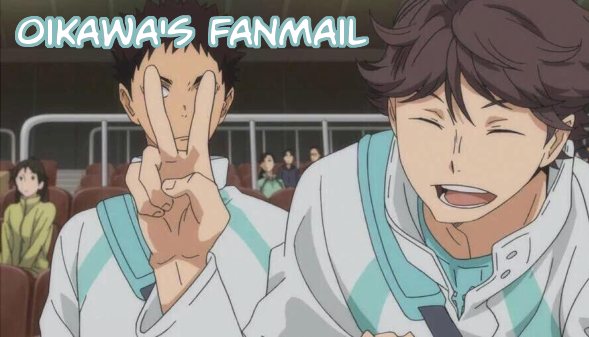 The last round of Oikawa's Fanmail is open until tomorrow!! Last week's fan mail was sent by Ouzou Furuya from Ginga E Kickoff! i forgot to save the banners before fairy-fountain closed (oops) so i made a new one! Last week's fan mail was sent by Itsuki Minami from Air Gear! Last week's fan mail was sent by Kantarou Ichinomiya from Tactics! Last week's fan mail was sent by Sayaka Akimoto/Akira Igarashi from AKB0048! Last week's fan mail was sent by Michiru Kita from Zombie Loan! Last week's fan mail was sent by Choi from Tamako Market! Last week's fan mail was sent by Kaoru Akashi from Zettai Karen Children! Last week's fan mail was sent by Eleanor Hume from Tales of Berseria!